Ladies and gentlemen, you've trained for ages. You have gotten gr8 at the video game, it is now time to BE GR8! There is a $50 PRIZE POOL* during the 4th week of every month! The first three weeks will decide seeding. 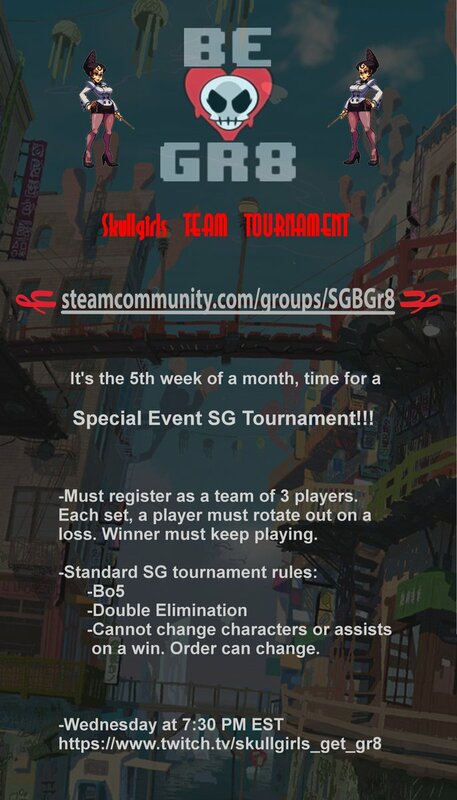 For months with a 5th week, there will be a Special Event SG Tournament!!! You may change teams/assists on a loss ONLY. Changing team order is permitted at any time. Bracket will also be RANDOM seeded at the start of the tournament for weeks 1-3. Week 4 seeding will be determined by performance during the previous 3 weeks. *You must have Paypal to accept payout. Flotilla and TheCrankMachine like this. i'll help spread this around. maybe even sign up, try to shake off some major rust i have. TheCrankMachine and Penumbra224 like this. just curious but you won't happen to need a Stream Lay out? okay! if you need anything just poke me. i like doing art for people. sending some new players your way Penumbra! Penumbra224 and TheCrankMachine like this. Wow, tourney last week was amazing! Ton of hype matches and a ton of fun to watch. Bit of a rule change for this week, matches will start at 7:30 PM instead of 7 due to some requests. This understandably makes it a bit harder for EU people, but for those with work or school commitments it makes it a bit easier. Maaaan, crazy matches last week. Seeding is kind of being messed with every week little by little, so expect it better every week. TheCrankMachine, Drills and Ninja like this. New signups are out! Good Luck! http://challonge.com/tournaments/signup/GL6e3artVm New signups o man! After missing out on Combo Breaker and now watching CEOtaku, I'm feeling a desperate need to get back into this game after my hiatus since Frosty. I'll check my schedule to see if I can make it in. Its been ages since I've played in an online tourney too. dapurplesharpie, FuLLBLeeD, Broseidon Rex and 1 other person like this. Alrighty signed up. Going to try to get out of work early for this. So where does everyone meet up? In a steam chat? On discord? Just let me know and I'll try to be there. New week is out! Still on vacation but my good ol friend ol friend crank is gonna keep on doin the cover move. Good luck to everyone who enters~! Ohhh man new week! Good luck to everyone who signs up! Week 20! Thats a pretty big milestone, thanks for everyone thats been playing :D Good luck! Standard Pokemon format rules, we'll be going live soon! Get a couple of friends and register!